After 20 years of argument we all kind of know everything about illegal immigration, don’t we? And in a funny way most of us agree on the essentials. Whether you see what’s happening on the border as a genuine crisis or merely a manufactured one, we agree there’s a problem. Hundreds of thousands of people a year are trying to enter America illegally. We need to make the situation more secure and orderly, less cruel. Both sides agree the problem has a humanitarian dimension. Democrats speak quickly of women and children being divided and abused once they make it to the border. This is a real problem. Republicans speak of women and children being abused on the way to it. That’s a problem too. There’s a lot of suffering going on. Both sides agree at least formally that a sovereign nation has a right to have borders, even a responsibility to have them. Borders say here’s where our land stops and yours begins. They say this is where your laws pertain, this is where ours do. We are nothing without the rule of law. It is what allows America to operate each day. 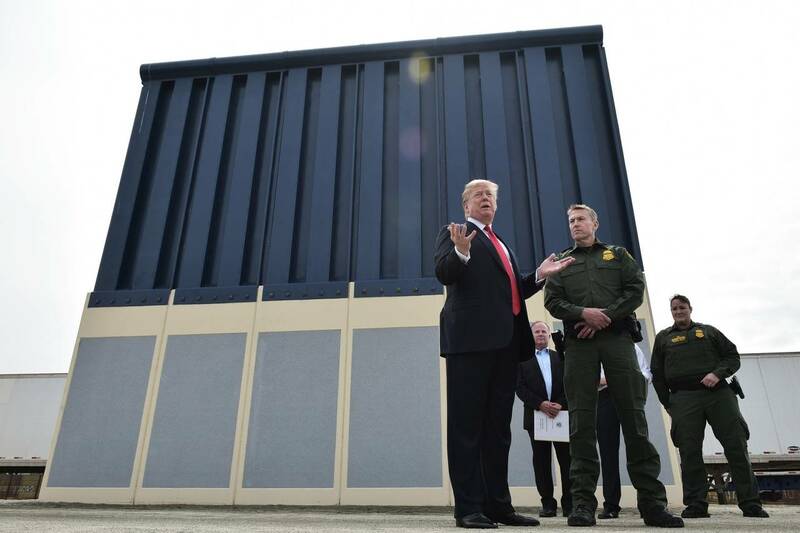 President Trump inspects border-wall prototypes in San Diego, March 13, 2018. Almost everyone would agree we have a right to determine the rules by which legal entry is attained. Most Americans would agree it is desirable to set those rules according to the nation’s needs. America is beginning to experience a shortage of registered nurses. Have you noticed? You will. Wouldn’t it be good to address the shortfall through immigration policy, inviting nurses from other countries to become legal residents and citizens? My people, from Ireland, were welcomed because the dynamic America of 1900 needed laborers and domestic workers. That, luckily, is what my people were. Two generations later I worked for an American president. What a miracle this place is. Let’s keep that up, the miracle part. Those of us who are not politicians agree that neither party has really wanted to solve the problem. Both played it for their own gain, cynically, as if they weren’t even invested in this place. They should be ashamed. It was not in the interests of the Republican Party to address the border problem because that might leave them open to charges they were driven by questions of race and color. Also their major donors didn’t mind illegal immigration, which was good for business. It’s always convenient when you see things the donors’ way! The affluent and powerful in America enjoy feeling liberal and are uninterested in how poor Americans view chaos (as a threat—America is all they have; they don’t have two passports and a share on a plane) and jobs lost to cheaper labor. Democrats never intended to control the border because they think doing nothing marks them as the nonracist party, the compassionate, generous party that Hispanics will see as home. They would reap the electoral rewards in a demographically changing country. They will own the future! Their big donors too opposed border strictness. They don’t think about security a lot, even after 9/11. I think it was Murray Kempton who said Republicans are always hearing the creak of the door at night. It’s true. Democrats are less anxious about security. It’s fair to point out they tend to be more affluent and have the protections money can buy. Their fearlessness is not bravery but obliviousness. They off-load anxiety onto Republicans, who are always mysteriously eager to take it up. I’ll throw in something else I think we agree on. Governing by shutdown is ignorant, cowardly and destructive. It is unjust to the innocent, who are forced to deal with reduced services, closed agencies and missed paychecks. It’s dangerous: Something bad will happen with air security, food inspection—something. It’s demoralizing: It makes America look incompetent in the world, unstable, like an empty adversary and incapable friend. It harms the democratic spirit because it so vividly tells Americans—rubs their faces in it—that they’re pawns in a game as both parties pursue their selfish ends. The president at the center of this drama is an unserious man. He is only episodically sincere and has no observable tropism toward truthfulness. He didn’t get a wall in two years with a Republican Congress and is now in a fix. He is handling himself as he does, with bluster and aggression, without subtlety or winning ways. He likes disorder. But the game didn’t start with Donald Trump. Two decades of cynical, game-playing failure produced him. Speaker Nancy Pelosi and Minority Leader Chuck Schumer have been just as unserious. Brinkmanship and insults—“malice and misinformation,” “soap opera,” “tinkle contest,” “as if manhood could ever be associated with him.” They are playing to their new, rising base and smirking slyly as the bear ties himself in knots. They demanded time to rebut the president immediately after his Oval Office speech. By tradition the networks offer response time after the State of the Union, not after every presidential address. This is because of a certain deference to the office. You allow a president—even if you hate him—to speak in the clear. He’s trying to lead; you let what he says settle in. Then the next day you formally hand him his head. If every presidential address is followed now by swift and furious rebuttal, we’ll never achieve any rough unity again. In the end Mr. Schumer and Mrs. Pelosi’s speech was no more a success than the president’s: it broke no new ground, didn’t even try to persuade. Trevor Noah caught the mood: They looked as if the hostess at IHOP just told them there’s no senior discount. All of Mr. Trump’s foes think they do what they do because of him. Extraordinary circumstances demand extraordinary measures. They become like him to fight him. But some day Donald Trump will be gone. What will we have then? His tormentors think we’ll go back to normal. We won’t, in part because of how they acted in opposition. They think everyone will revert to courtesies, but they will have killed the old ways. Stop this. It’s embarrassing. And it’s wrong. Make a deal.